Colin Kaepernick is RIGHT, Facing The Truth and Reality is TOUGH! You are here: Home / News / Colin Kaepernick is RIGHT, Facing The Truth and Reality is TOUGH! Kaepernick faced reality and refused to look away. What Mr. Kaepernick experienced was an epiphany, an illuminating discovery, realization, or disclosure, as defined by Webster Dictionary. It’s really tough, as such clear observances, almost always causes one to collect himself and take a clear examination of “the lay of the land.” Taking a clear examination of “the lay of the land,” he examined the specifics surrounding the killings of African Americans by errant police officers and their proxies. Once looking at the killings of African Americans, by errant police officers and their proxies, he resulted to action. His defiant actions led to the kneeling of other National Football League (NFL) players. Mr. Kaepernick took action within his space! WHEN WILL BLACK AMERICA AND OTHERS, FIND THE COURAGE TO SUPPORT HIM AND OTHER PLAYERS, WHO ARE FIGHTING TO FIND SOLUTIONS TO STOP THE KILLINGS? However, Mr. Kaepernick was not the only one who thought these killings were unusual. The Washington Post newspaper did an article on these killings and mathematically calculated, Black Americans were being struck down at a rate of two and one-half times that of their white counterparts, when you consider that African Americans make up 13 percent of the American population, while whites make up 62 percent. 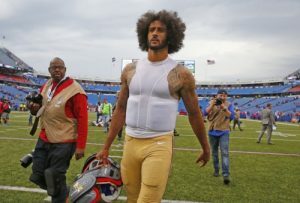 What was an epiphany for Mr. Kaepernick was now being statistically validated. There is something going on here. Blacks are being gunned down at an astronomically higher rate, then whites (http://www.chicagotribune.com/news/nationworld/ct-police-shootings-race-20160711-story.html). Continue to tweet the NFLPA NOW, and keep tweeting them, LETTING them know you stand with them in their search for solutions (it is the least that we can do) @ https://twitter.com/NFLPA by the hundreds and ask them to use part of the money owners have offered them, (90 million dollars), to sponsor a meeting of stakeholders. Also one can Follow him on Twitter;Jamesabides1.